This could be one of the best deals on the used supercar market. Jon Olsson is selling his customized winter-prepped Lamborghini Huracan for €250,000 ($269,175). The Swedish skier and noted gearhead took to Instagram to announce the sale, saying that he needed a four-seater. 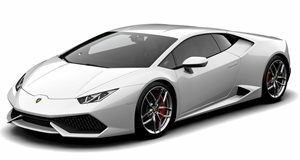 The Huracan has 3,800 kilometers (2,361 miles) on it and has been tuned extensively. Thanks in part to a new supercharger the Lamborghini has over 800 horsepower. In addition to being a monster in the power department it’s also winter-ready with a rooftop ski box and all-wheel drive. That winter camo wrap is also pretty sweet too. According to Olsson the actual cost of creating this custom Huracan is close to €350,000 ($376,806), which makes its asking price seem like a steal. Actually, this is a steal of a deal even when compared to the base model’s MSRP, which is around $237,000. Spending a little over $30k extra nets you 200 extra horsepower, and you can actually drive this thing around in the snow. Despite the fact that the car is located in Monaco it most certainly didn’t live the life of a garage queen. The real question is not how much this car will sell for. (Olsson should easily find someone who meets his asking price.) No, the question we should all be asking is what car will the Swede will set his sights on next.